Free Download Casio EXILIM EX-100 PDF User Manual, User Guide, Instructions, Casio EXILIM EX-100 Owner's Manual. 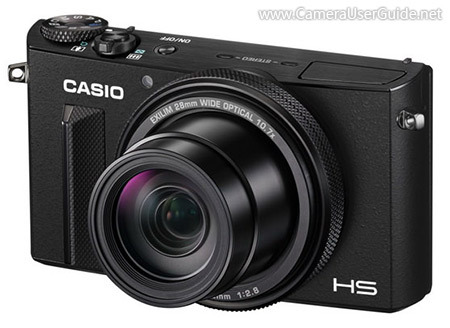 Casio Exilim EX-100 sport a bright constant F/2.8 10.7x (28-300mm) optical zoom lens covers a wide range of shooting situations and produce crisp photos even shooting in low light. The 12.1 MP 1/1.7-inch back-illuminated CMOS sensor delivers stunning low-noise images even under low-light condition. The 5-axis Image Stabilization helping you to capture beautiful, blur-free photos. The powerful EXILIM Engine HS 3 offers super-fast 0.17 second AF time, 0.25 second Shooting interval, high-speed continuous shooting up to 30 fps and 6 fps with Auto Focus. The EXILIM EX-100 features dual-combination bracketing function, that combines two separate parameters and shoot up to 9 images. The Manual Bracketing function enables users to explore the settings of each parameter manually. The large 3.5-inch tilting LCD screen can be tilt-up 180 degrees and tilt-down 55 degrees for easy shooting at virtually any angle. The unique Front Shutter allows you to operate the shutter from a natural posture when shooting at low or high angles with the tiltable LCD screen. The built-in stand keep the camera stable on a tabletop or other surface while the LCD screen is tilted upwards 180 degrees. The EXILIM EX-100 is built-in Wi-Fi that allow you to sent images to your smartphone or tablet. You can also using a smartphone as a camera remote controller. Other highlights include 1080/30p full-HD movie recording, raw image capture, interval shooting, time-lapse, high speed movie up to 1000fps, Premium AUTO Pro, full manual control and All-in-focus macro. Casio EXILIM EX-100 PDF User Manual / Owner’s Manual / User Guide offers information and instructions how to operate the EXILIM EX-100, include Quick Start Guide, Basic Operations, Advanced Guide, Menu Functions, Custom Settings, Troubleshooting & Specifications of Casio EXILIM EX-100. If you need Casio EXILIM EX-100 PDF User Manual / Instruction Guide / Owner's Manual in other languages, please feel free to leave your comments at the bottom of this page.